Packs of 100 square sectioned, large headed, blued steel nails forged from cold drawn stock. Due to their irregularly surfaced four sided shafts (and larger surface area) forged nails are more difficult to pull out than their common round or oval counterparts. A slight taper down the length of these nails also helps reduce the risk of splitting when used near the ends or edges of boards. 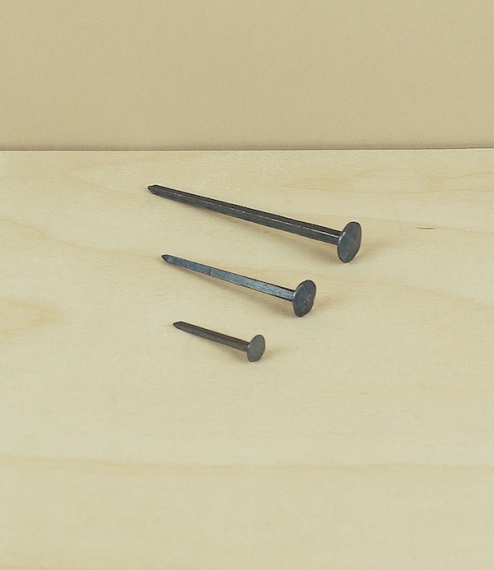 Available in 3 sizes, door nails of about 30mm, board nails of 50mm, and floor nails of 70mm.